GRAIAI (Graeae) were two, some say three, sea hags who personified the white foam of the sea. They were grey-haired from birth and shared amongst themselves a single, detatchable eye and tooth. The hero Perseus stole these when he was searching for the Medousa (Medusa), compelling the hags to reveal the location of their sister. The names of the Graiai suggest rather dire monsters--Deino is the "the terrible," Enyo "the warlike" and Persis "the destoyer." Another, Pemphredo, "she who guides the way," was so named for her role in the story of Perseus. The sisters formed the chorus of a play entitled the Phorcydes by Aeschylus, part of the dramatist's trilogy on the life of Perseus. The Graiai were usually depicted as old crones. According to Aeschylus, however, they were Seiren-shaped monsters with the head and arms of old women and the bodies of swans. It is worth comparing the Graiai with the monster Lamia whom Greek writers likewise describe as a monstrous Libyan woman with removable eyes. GRAEAE (Graiai), that is, "the old women," were daughters of Phorcys and Ceto. They had grey hair from their birth. Hesiod (Theog. 270, &c.) mentions only two Graeae, viz. 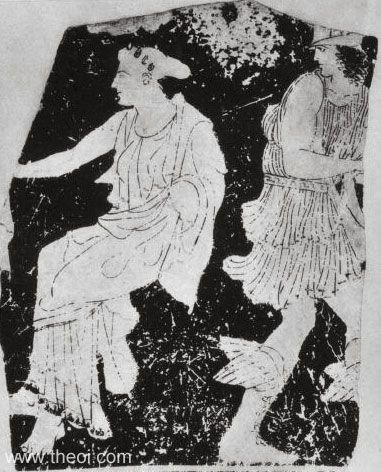 Pephredo and Enyo; Apollodorus (ii. 4. § 2) adds Deino as a third, and Aeschylus (Prom. 819) also speaks of three Graeae. The Scholiast on Aeschylus (Prom. 793) describes the Graeae, or Phorcides, as he calls them, as having the figure of swans, and he says that the three sisters had only one tooth and one eye in common, which they borrowed from one another when they wanted them. It is conmmonly believed that the Graeae, like other members of the family of Phorcys, were marine divinities, and personifications of the white foam seen on the waves of the sea. "And to Phorkys (Phorcys) Keto (Ceto) bore the Graiai (Graeae), with fair faces and gray from birth, and these the gods who are immortal and men who walk on the earth call Graiai, the gray sisters, Pemphredo robed in beauty and Enyo robed in saffron." "He [Perseus] had made blind the grim offspring [the Graiai (Graea)] of Phorkys (Phorcys)." The Phorcides was the second of a trilogy of plays describing the story of Perseus. The plot revolved around Perseus' quest for the head of Medousa (Medusa). The Graiai (Graea, Grey Ones), sisters of the Gorgones, formed the chorus. "[Prometheus warns Io of the perils she will face in her journey :] First, to you, Io, will I declare your much-vexed wandering, and may you engrave it on the recording tablets of your mind. When you have crossed the stream that bounds the two continents [probably the Red Sea], toward the flaming east, where the sun walks . . ((lacuna)) crossing the surging sea until you reach the Gorgonean plains of Kisthene (Cisthene), where the Phorkides (daughters of Phorkys) dwell, ancient maids (dênaiai korai), three in number, shaped like swans (kyknomorphoi), possessing one eye amongst them and a single tooth; neither does the sun with his beams look down upon them, nor ever the nightly moon. And near them are their three winged sisters, the snake-haired Gorgones (Gorgons), loathed of mankind, whom no one of mortal kind shall look upon and still draw breath. Such is the peril that I bid you to guard against." "[Prometheus addresses the maiden Io :] When you have crossed the stream that bounds two continents press on, over the surge of the sea, toward the east where the sun stalks in flame, to the Gorgonean land, Kisthene (Cisthene). There live Phorkys' (Phorcys') aged virgin daughters, in shape like swans, possessing one eye and one tooth between the three; beings on whom no ray of sun ever looks down, nor moon at night. And close to them their three winged sisters . . . the snake-haired Gorgones (Gorgons)." "Phorkys (Phorcys) and Keto (Ceto) had [children] the Phorkides (Phorcides) and the Gorgones (Gorgons)." "So with Hermes and Athene as his guides Perseus sought out the Phorkides (Phorcides), who were named Enyo, Pephredo, and Deino. These daughters of Phorkys (Phorcys) and Keto (Ceto), sisters of the Gorgones (Gorgons), were old women from their birth. The three of them possessed only one eye and one tooth among them, which they took turns using. Perseus appropriated these, and when they demanded them back, he said he would return them after they had directed him to the Nymphai (Nymphs) . . . When the Phorkides had led Perseus to the Nymphai, he returned them their tooth and eye." "He [Perseus] that stole the lamp [eye] of his three wandering guides [the Graiai (Graeae)]." "From Phorcus and Ceto [were born] : Phorcides [named] Pemphredo, Enyo and Persis--for this last others say Dino." "As Aeschylus, the writer of tragedies, says in his Phorcides, the Graeae were guardians of the Gorgones. We wrote about them in the first book of the Genealogiae. They are thought to have had but one eye among them ,and thus to have kept guard, watch one taking it in her turn. This eye Perseus snatches, as one was passing it to another, and threw is in Lake Tritonis. So, when the guards were blinded, he easily killed the Gorgon when she was overcome with sleep." "Agenorides [Perseus] told him [Kepheus (Cepheus)] of the place that lies, a stronghold safe below the mountain mass of icy Atlas; how at its approach twin sisters, the Phorcides [Graiai (Graea)], lived who shared a single eye, and how that eye by stealth and cunning, as it passed from twin to twin, his sly hand caught, and then through solitudes, remote and trackless, over rough hillsides of ruined woods he reached the Gorgones' lands." "He [Perseus] crept up on tiptoe, keeping his footfall noiseless, and with hollowed hand and robber’s fist caught the roving eye of Phorkys' (Phorcys') unsleeping daughter [the Graia (Graea)], then shore off the snaky swathe of one Medousa (Medusa)." "He [Perseus] laid ambush for the sentinel eye of Phorkys (Phorcys), the ball of the sleepless eye [of the Graiai (Graeae)] that passed from hand to hand, giving each her share under the wing of sleep in turn." "The round island of the Graiai (Graeae) [lay somewhere beyond India]." "[Perseus] had taken the travelling eye of Phorkys' (Phorcys') old one-eyed daughter unsleeping [the Graia (Graea)]; he dived into the dangerous cave [of the Gorgones], reaped the hissing harvest by the rockside, the firstfruits of curling hair, sliced the Gorgon's teeming throat and stained his sickle red."